Nestled between the Adirondacks of New York and Vermont's Green Mountains, Lake Champlain offers 120 miles of tranquil beauty with a rich, bustling history. Picturesque waterfront communities established in the 18th century recall the era when the Champlain Valley's natural resources—iron, lumber, granite, marble, and potash—were shipped to distant ports on lake sloops and schooners. By the early 19th century, Lake Champlain was connected with the canals of New York and Quebec, and the resulting economic boom lasted for 100 years. Apples, hay, bricks, and finished goods were shipped on thousands of workaday canal boats that were also floating family homes. Massive steamboats carried travelers and tourists drawn to the fresh country air, and lakefront camps sprang up everywhere. Automobiles traveled over Lake Champlain on ferries and bridges. 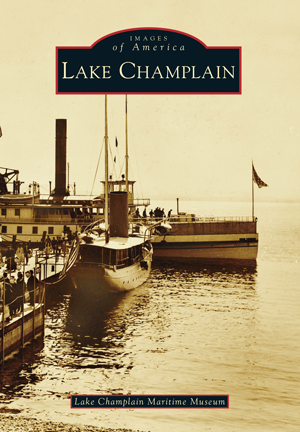 Through stunning historical images from the archives of Lake Champlain Maritime Museum and other regional collections, Lake Champlain tells the story of this busy commercial corridor and pastoral recreational destination. Lake Champlain Maritime Museum, a nonprofit located in Vergennes, Vermont, shares underwater discoveries and lake history with the public in exciting and imaginative ways. The study of historic shipwrecks and nurturing traditional maritime skills inspire the museum's hands-on programs, full-scale working replica vessels, and dynamic exhibits at a four-acre lakeside campus.